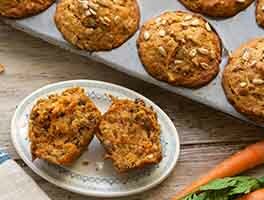 Chock full of fruits, nuts, seeds, and carrots, these muffins are a deliciously wholesome way to start your day. Enjoy them on the go or as part of a breakfast spread, and watch them disappear. 25 mins. to 28 mins. 45 mins. to 53 mins. Preheat the oven to 375°F. Lightly grease 10 cups of a 12-cup muffin pan, or line with 10 papers lightly sprayed with cooking spray. In a small bowl cover the raisins with hot water and set aside. In a large bowl whisk together the Multi-purpose flour, sugar, cinnamon, ginger, baking soda, xanthan gum and salt. Stir in the carrots, apple or pineapple, coconut and nuts. in a separate bowl, beat together the eggs, oil, vanilla and water. Add to the flour mixture and stir until evenly moistened. Drain the raisins and stir them in. Scoop the batter (a scone and muffin scoop works well here) into the prepared wells. They will be nearly full; that's okay. 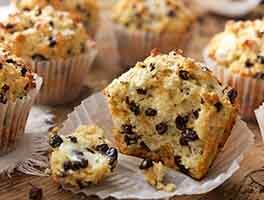 Bake for 25 to 28 minutes, until a cake tester inserted into the center of one muffin comes out clean. 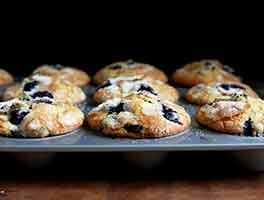 Remove the muffins from the oven and, after 5 minutes, transfer them to a rack to cool. Wrap any leftovers airtight and store at room temperature for several days; freeze for longer storage. This recipe produces a delicious result! I didn't have muffin tins, so I used a loaf pan. I lowered the oven temp to 350, and baked it for about 50 min, until it reached 200 degrees internally. This is a sweeter bread, but it's so moist. My 18 month old son is a fan! I didn't have apple or pineapple, so I used grated pear, and used quick oats in place of nuts. Can't wait to make this one again for company! 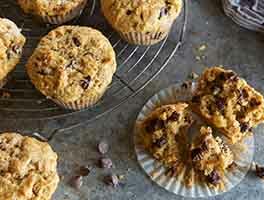 I have made many GF muffin recipes and this one is one of my favorites! Made this recipe today with only a couple of changes. Amazingly moist and tender - could not tell these were gluten free. Changes I made - I did not have any nuts on hand so substituted 1/2 cup GF quick cooking oats. Also added 1 tbsp of ground flax meal. Used a silicone mini muffin pan, filled each cup to almost over the top and baked in 375 oven for 20 mins. They rose up nicely and were perfectly baked. Will make this recipe again. Thank you for a very nice recipe. 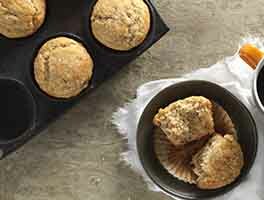 This is the recipe that convinced me there are great gf recipes out there, and I could survive this new reality in my life called life after gluten! Love them! And when I had to make them vegan for a friend, I substituted flax eggs for the eggs and they were still perfect! These are amazing. Seriously. You (and I) nailed it. Make these and you will not be sorry. These were good! We recently had to convert to being gluten and dairy free and miss our muffins and breads. My kids didn't notice a difference. I saw a slight texture change but they still tasted good. Would strongly recommend shredding your own carrots. Store shredded carrots were larger, longer shreds and we didn't like the stringiness they added. These turned out great and my family didn't even know they were gluten free! (Usually I make GF stuff for myself and regular for them.) I made the recipe as-is, except for one substitution: 1 Tbsp chia seeds instead of xanthan gum. For the oil, I used half olive and half avocado oil. Pulsed the carrots and apple in my vitamix for a few seconds to save time. Since I live at high elevation, I only baked them for 20 minutes at 375 F. Next time I might try sweetening with honey instead of brown sugar. The morning glory muffins I made using this recipe were pretty good. There's not too much sugar in them, but the apple (which I used instead of the pineapple) and the carrots make them delectably sweet. 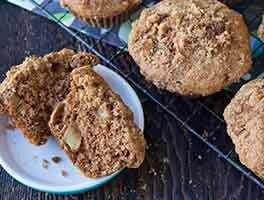 However, they look nothing like the muffins in the picture! Mine did not rise at all, though the ones in the picture certainly look as if they did. Also, the color of the muffin is nothing like the one in picture either. They are much, much darker, more like gingerbread or pumpkin bread in color than the light orange they show. Also, is Xanthum Gum necessary? Or are they just trying to get us to buy another product from them?